Chelsea's inaugural exhibition at Millbank. 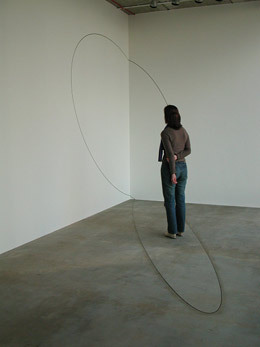 Gary Woodley's new site-specific work explores real and hypothetical space within the gallery. New spaces can be disorientating, revelatory, terrifying, liberating. We analyse space for safety, usability, desirability. Gary Woodley analyses space more than most. He meticulously measures architectural environments; he observes every dimension and material surface and then renders these spaces as 3D computer drawings. At this speculative drawing stage he imposes an invented configuration of either fixed volume or infinite extension onto the original 3D space: an invented space is forced onto (ie impinges on) the 'real' space. 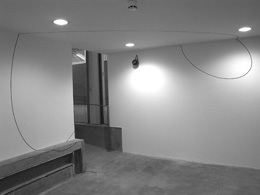 The linear drawing of where the invented volume cuts into the original space is transferred onto the architecture, usually with simple materials such as crayon, flexible tape or, the slightly more high-tech, electro luminescent strips. To some extent, of course, the use of materials such as tape is a pragmatic solution to the temporary nature of art exhibitions. Woodley's 'Impingement' works could be made more permanent by the use of inlays of materials such as metal or stone. 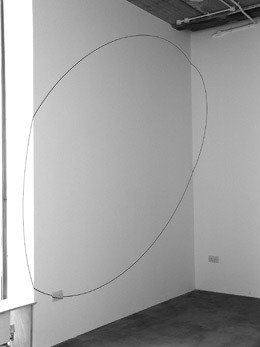 But, the very fact that the work is most often made of ephemeral materials, that there is usually no art 'object' as such, and that the tape is ultimately destined for the rubbish bin, or that the crayon is rubbed away or painted over, is an intrinsic part of an understanding and enjoyment of the work. Woodley is a very skilled craftsman; given his enormous understanding of materials, the 'dematerialised' nature of the work is even more intriguing. There are drawings, documentary photographs etc. but the work itself often passes without trace. Impingement: To encroach or infringe; to collide with; to make an impression on; to strike, drive or fix upon something else. This word, 'Impingement' that Woodley has used for an open series of works since the 1980's, seems to sum up perfectly his process of imposing one situation onto another. Whilst his practice is restrained, cerebral, cool, thee is also a forceful, almost belligerent aspect to this work too. Woodley has described his drawings as being "thrown" onto the architecture and certainly, whilst his work helps reveal architectural structure, it also disturbs its equilibrium. Gordon Matta Clark cutting through the fabric of buildings with a chain saw and, in at least one instance slicing a building right through, immediately springs to mind - an idea of 'Breaking up something to see how it works'! Lisa Le Feuvre has described Matta Clark's cutting process as drawing through space. This, and the idea that one must move through space to make sense of the work, that cannot be seen from a single view, has great affinity with Woodley's practice. In this exhibition one doesn't simply enter a room, one enters a work by Gary Woodley as though we are inside his computer drawing. He starts off with measuring - a matter of fact Euclidean geometry, but then takes us to new dimensions, his invented configuration a kind of alien volume floating inside and outside of our understanding of space. Beyond its apparent simplicity, Woodley's work alludes to a continually evolving, shape-shifting, non-Euclidean universe and ideas of dimensions as yet unknown.